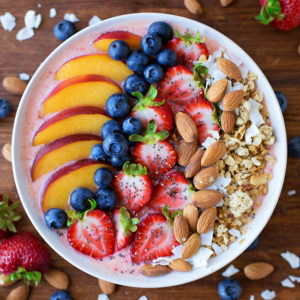 This berry, peach and coconut smoothie bowl is packed full of fruit, fiber and protein! It’s a simple and easy way to turn a healthy smoothie into a filling meal! I love smoothies, but I recently discovered that I really LOVE smoothie bowls. Have you tried one? If not, please, please, pleeeease let this one be your first. I promise you’ll be hooked! 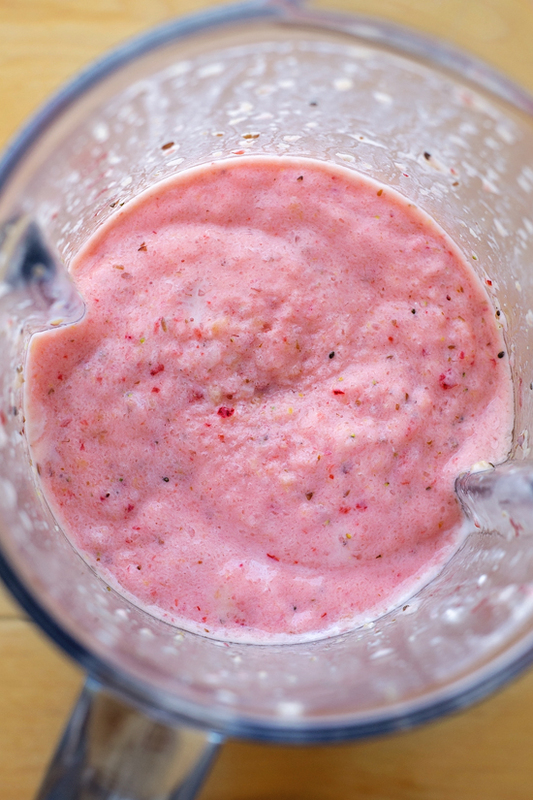 Smoothies are great, but unless they’re packed with nut butters, they’re not super filling. After my morning run I’m always looking for something more than just a drink. That’s were this smoothie bowl comes in. I’ve taken my favorite smoothie and topped it with fresh fruit, granola, almonds, coconut and chia seeds. It’s exactly what I need to kick-start my day! ???? I rotate through smoothie recipes each week, but one of my all-time favorites is made with ice, Greek yogurt, frozen strawberries, frozen peach, frozen pineapple, spinach, orange juice and a few scoops of a flax/chia/coconut blend. It’s amazing. So good! My kids absolutely love it (and it’s such a good way to sneak in some extra greens). But like I mentioned above, most days it’s just not enough. So I make it extra thick by freezing all of my fruit and by reducing the amount of liquid I pour in. 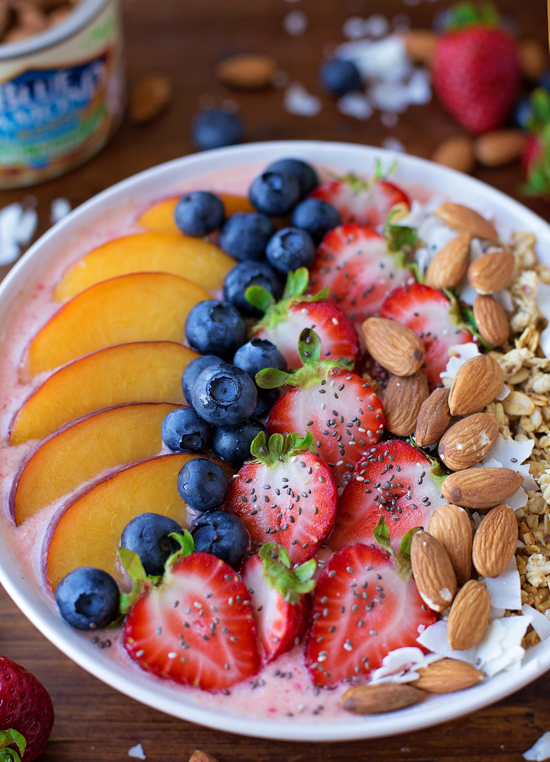 After blending it for about 2 minutes, I pour it into a big bowl and top it with strawberries, blueberries, peaches, coconut granola, coconut flakes, chia seeds and of course, almonds. They go nuts for it, and so do I!! 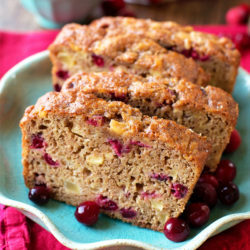 It’s kind of like eating frozen yogurt for breakfast, only slightly more appropriate. ???? You can easily customize your smoothie bowl by using whatever fruit, granola or nuts you have on hand. However, I really love using Blue Diamond Whole Natural Almonds because they’re simple, wholesome and delicious. Speaking of Blue Diamond, did you know that they’re helping to fuel Team USA Swimming athletes. That’s right, they’re the Official Snack Nut of the organization. 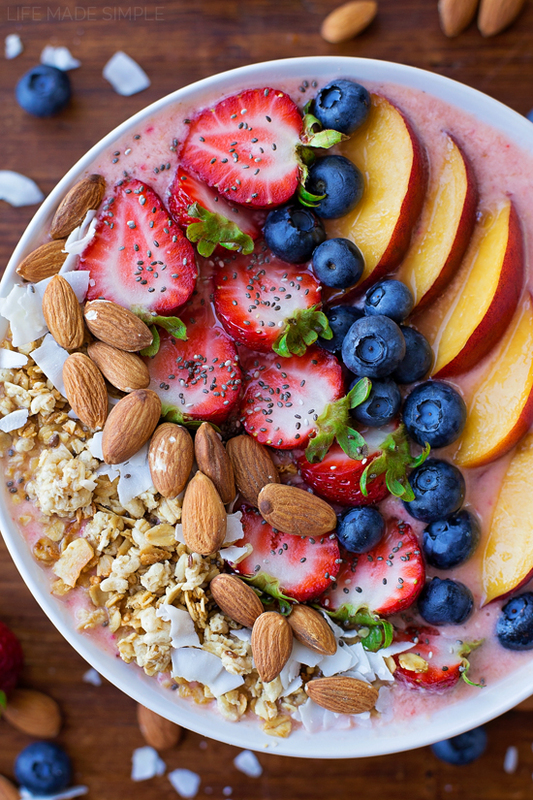 This smoothie bowl would be the perfect post-workout snack for them, don’t you think? It’s definitely one of mine!! Once you dive into a bowl like this, you’ll never want a regular smoothie again. ???????????? 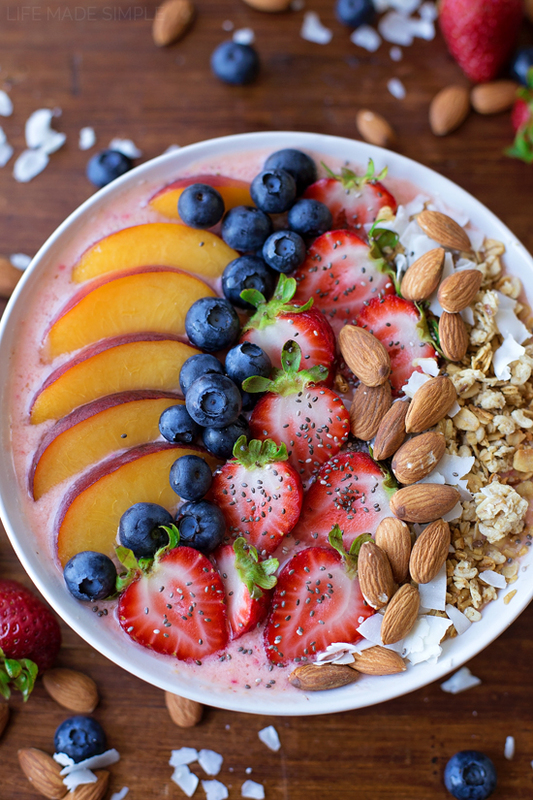 This berry, peach and coconut smoothie bowl is packed full of fruit, fiber and protein! It's a simple and easy way to turn a healthy smoothie into a filling meal! Place all ingredients for the smoothie in the bowl of blender, placing the heaviest ones on top. Blend until smooth, about 2 minutes. 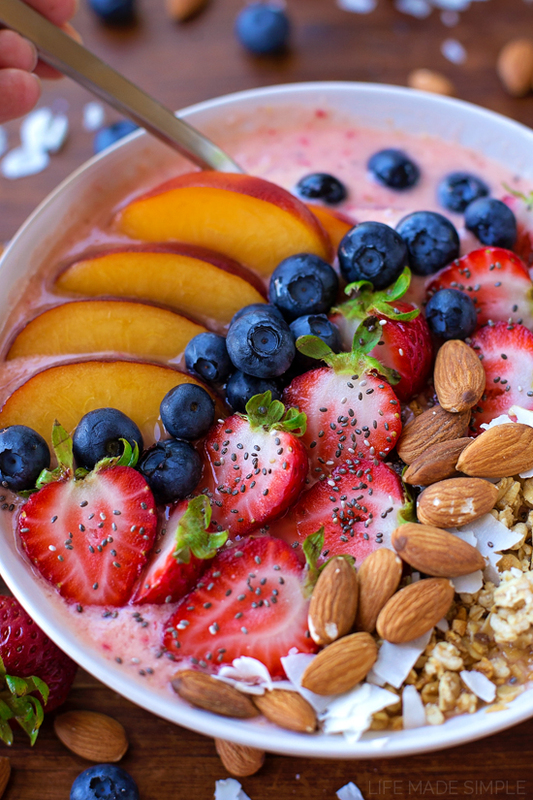 Pour into a bowl and top with fruit, granola, almonds, coconut and chia seeds. 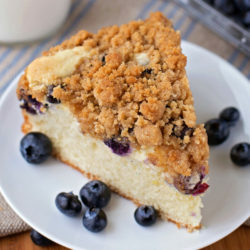 Enjoy immediately. -You cans swap out Greek yogurt for any yogurt you like. -Blue Diamond Toasted Coconut Almonds are also delicious in this smoothie bowl! This post is sponsored by Blue Diamond Almonds, all opinions are my own. Blue Diamond Almonds understand what it takes to be the best. That’s why we’re proud to be an official sponsor of USA Swimming. 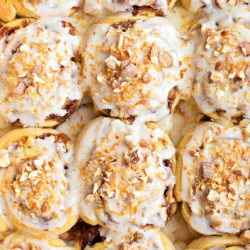 Visit www.LaneToGreatness.com for a chance to win $5,000 to fuel your dreams of greatness (whatever they may be), get Blue Diamond Almonds coupons and recipes, and more!